This 40-year-old drug is even more effective than current options. The global public health threat of antibiotic resistance has made many existing antibiotic treatments ineffective, but a new study could provide a creative solution to the growing problem. In a study published in the journal Cell Chemical Biology, researchers from the University of Queensland in Australia re-analyzed an old and largely forgotten antibiotic. Discovered 40 years ago, the drug could potentially take on resilient superbugs. Octapeptin has long been considered an obsolete antibiotic by medical science, but the researchers believe it could potentially replace a so-called “drug of last resort” called colistin. These are drugs given to patients only when all other treatment options have been exhausted without success. 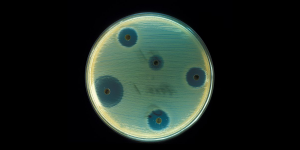 Over time, however, the bacteria colistin is meant to treat have developed increasing resistance to it, rendering the last resort ineffective. Researchers hope that octapeptin, a relic of past medicine though it may be, could be revived and reworked as a new drug. Octapeptin is uniquely capable of serving as a replacement for colistin, primarily because the two drugs are structurally similar. Octapeptin has also been shown to be especially effective against gram-negative bacteria, a type of bacteria that are notoriously difficult to treat. In addition to its structural similarities and relative effectiveness, researchers believe octapeptin may prove to be superior to colistin, and even less toxic. Over the last 30 years, antibiotic resistance has been of growing concern, reaching public health crisis levels in many parts of the world. Despite these urgent circumstances, only one new class of antibiotic has emerged. As such, the University of Queensland researchers are hoping that by re-analyzing the older antibiotic and introducing it as a superior alternative once colistin fails, they will at least have provided another weapon in our arsenal; potentially, a very powerful one. The team’s creative solution could also inspire other research that looks to repurpose old, forgotten about drugs — or even create brand new ones — that could be stockpiled for the ongoing fight against antibiotic resistance.